What do you get when you add an astrophysicist and a number theorist to a comedian? 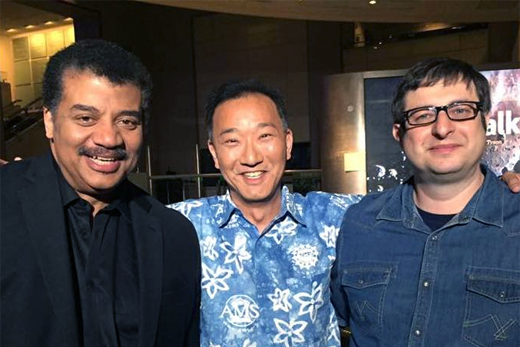 A fun conversation when those variables are (from left) National Geographic Channel's Neil deGrasse Tyson, Emory mathematician Ken Ono and stand-up comic Eugene Mirman. You can see a clip from the episode, to air Monday, Nov. 7 at 11 p.m., on eScience Commons. Ono and deGrasse, who are also joined by comedian Eugene Mirman, discuss everything from serial killers to the beauty in hidden patterns and how the Indian mathematician Srinivasa Ramanujan tamed Pi. The episode, which is devoted to Ramanujan, will also feature actor Jeremy Irons. He will discuss his role as the mathematician G. H. Hardy, Ramanujan's mentor, in the film "The Man Who Knew Infinity." Ono served as an associate producer and the mathematical consultant for the film. Ono and Irons will also be featured in a White House panel discussion as part of an event entitled "Math and the Movies" on Friday, Oct. 28. You can watch the event live, starting at 5:30 p.m., via this link.